The plinth plays not only a functional, but also an aesthetic role. 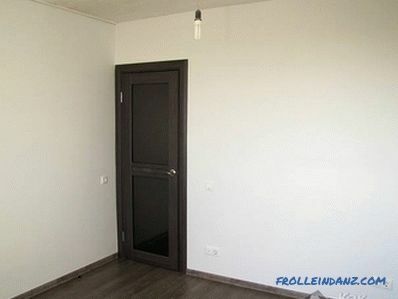 With its help, the gap between the wall and the floor is closed, and the room itself acquires a finished look. If you choose the plinth wrong, then all the impressions of the repair can be completely crossed out. In order to focus on the merits of the design of the room, you should consider the question of choosing a plinth responsibly. If you are afraid of miscalculation , then pick up the plinth by the color of the laminate. But to create a unique design it is better to use tones slightly darker or lighter than the floor covering. Plinth, corresponding to the tone of the floor, merges with it, and does not visually attract attention. By the color of the plinth can be chosen to match the walls. If wooden doors are installed, the plinth can be matched to the trim with platbands. To make such a solution look harmonious, the frames and the plinth should be of the same thickness and size. Recently, designers have begun to use white skirting. It can look beautiful if you take into account many factors, such as the combination of colors of the walls, floor and furniture. Perhaps, before choosing a plinth for a laminate, it is better to sketch the interior in a special architectural program and conduct experiments with colors. 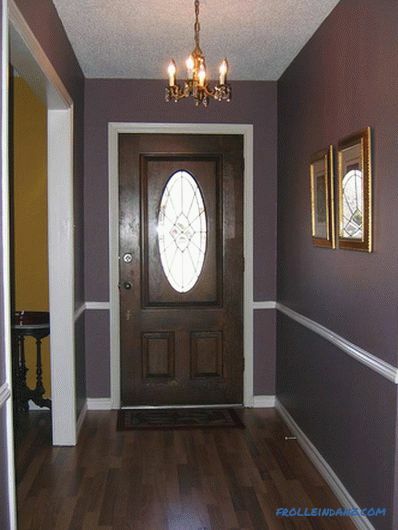 This is due to the fact that the contrast in the colors of laminate and plinth is a rather bold decision. How successful it will be depends on the reasonableness of all the details of the repair. To make repairs in the room look like harmoniously, you should decide on the size of the plinth. 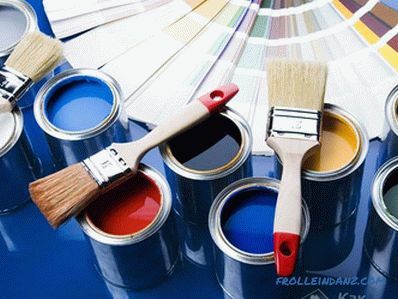 It depends on the color of the floor, walls and ceiling height. 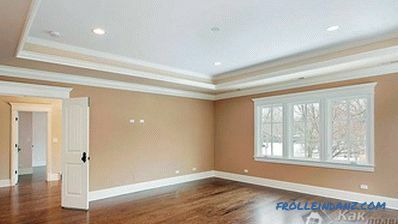 In large and high rooms it is unacceptable to use a small size baseboard. This will change the visual space is not for the better. In this case, it is more appropriate to install a wide plinth of a contrasting color that is attached to the wall. To visually increase or at least not reduce the height of low walls, you should choose a thin baseboard, preferably corresponding to the tone of the walls. 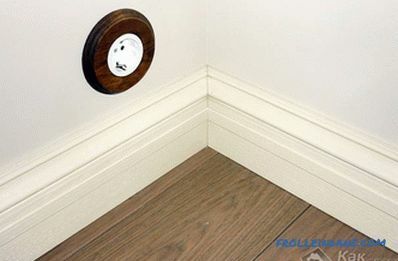 If you have a standard room, then you can use skirting with a standard height, ranging from 4.5 to 7 cm. Depending on the quality of the floor covering, you should choose a material for the plinth. If you have an expensive laminate in your room, then it can be combined with a wooden plinth. If the flooring is of medium quality or even lower than the average, then there is no sense to lay a wooden plinth, it is quite possible in such a case to get along with its counterpart from MDF, veneered wood or PVC (plastic). The times when the plinth was of the same shape, color, and size are a thing of the past. 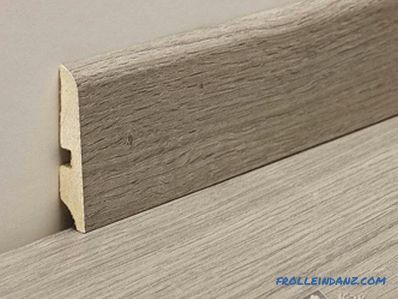 A wide range of baseboards made of different materials, differing in shape, color and texture, is available on the modern market. 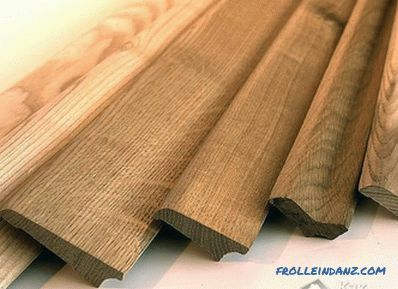 The most environmentally friendly material is wood. Plinths from this material have a presentable appearance, are easy to install, do not require special care. 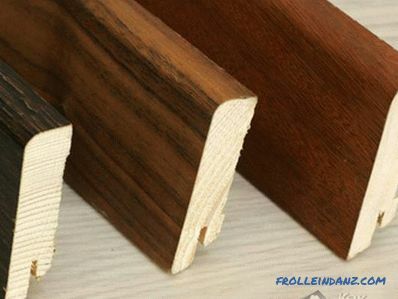 The material is sensitive to moisture, so it can not be installed in rooms with high humidity. The most cost-effective plinth is made from pine. Oak and linden are more expensive, but look nobler. Wooden plinths are sold without varnished coating, which makes it difficult to determine the final color. To roughly represent the color of the lacquered plinth, swipe the tree with a wet sponge. This shade will be similar to the varnished plinth. The base of the veneered plinth is spruce or pine. 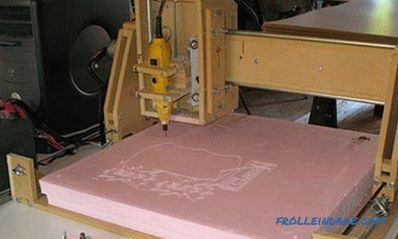 A veneer or a thin plate of noble rock is glued to the finished form under the influence of temperature. It can be acacia, oak, walnut, pear, bamboo, etc. 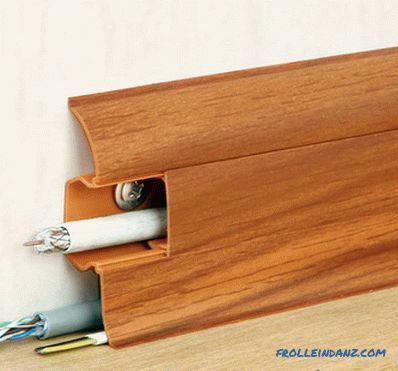 Such products are made with a cable channel that allows you to hide the wires under them. If the walls in your house are covered with MDF and the floor is covered with laminate, then just choose the plinth of MDF. They are made from pressed wood fibers and binders. 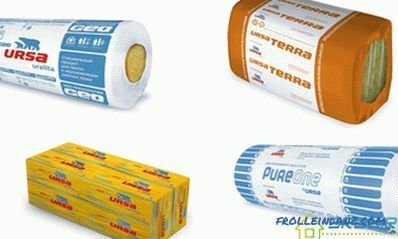 Such products are not afraid of dirt and moisture, they do not fade in the sun. The budget option is PVC. The range of plinth plastic is very wide. Due to this, everyone can choose the appropriate option in form and color. 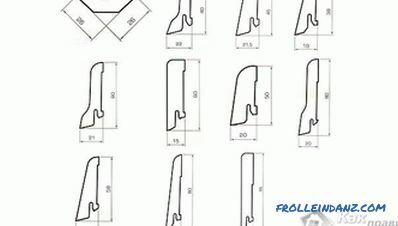 Among the advantages should be noted resistance to moisture, corrosion and rotting, however, the strength of the material leaves much to be desired. 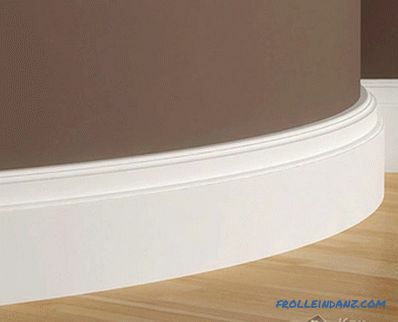 Polyurethane skirting is also made today, which is particularly flexible. 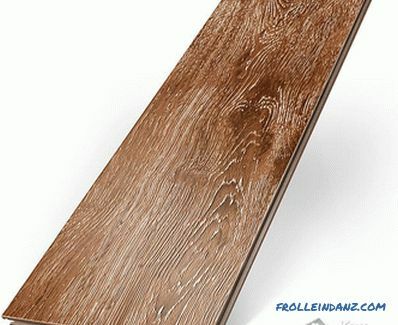 If you choose plinth to the laminate in accordance with the peculiarities of the room itself coverage and cost of the material, then your repair will be completed on time, and the end result will delight you and your guests. Do you have any questions on the topic or just want to comment on the article? Then we wait for your questions and comments.